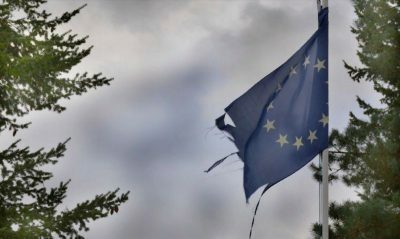 Europe now faces its ultimate ideological fork-in-the-road, which it has thus far ignored but can no longer ignore: They need to decide whether they seek a world of nations that each is sovereign over its own territory but over no other (and this would not be a world at war); or whether they seek instead a world in which they are part of the American empire, a world based on conquests — NATO, IMF, World Bank, and the other US-controlled international institutions — and in which their own nation’s citizens are subject to the dictatorship by America’s aristocracy: the same super-rich individuals who effectively control the US Government itself (see this and this — and that’s dictatorship by the richest, in the United States). The US aristocracy overthrew Iran’s democratically elected Government in 1953 and imposed there a barbaric dictatorship which did the bidding of the US and allied aristocracies, by installing the Pahlavi Shah there, just as they had earlier, in 1932, installed the Saud King in Saudi Arabia — which land never ever had known democracy. As Wikipedia says of Ibn Saud, who became King in 1932, “After World War I, he received further support from the British, including a glut of surplus munitions. He launched his campaign against the Al Rashidi in 1920; by 1922 they had been all but destroyed,” with Britain’s help. Similarly, the US and its British Imperial partner installed Pahlavi as Iran’s Shah in 1953. This was done by US President Dwight David Eisenhower. After the death of the anti-imperialistic US President FDR, in 1945, the US Government quickly became pro-imperialistic under President Harry S. Truman (whom imperial England’s Winston Churchill wrapped around his little finger), and then even more so under Eisenhower, so that during the brief presidency of Ike’s successor President JFK, the anti-imperialistic ghost of FDR was coming to haunt the White House and thus again threaten the conjoined US-UK’s aristocracies’ surging global control. Kennedy was quickly souring on, and coming to oppose, imperialism (just as FDR had done) — he was opposing conquest and dominion for its own sake. So, he became assassinated and the evidence was covered-up, so that the CIA, which Truman had installed and which Eisenhower placed firmly under the control of America’s aristocratically controlled military-industrial complex, became increasingly America’s own Deep State, designed for global conquest (though using an ‘anti-communist’ excuse and cover for their real and ruling motive of global conquest and dominion). When the US-imposed Shah was overthrown by an authentic revolution in 1979, America’s continued alliance with the UK-US-installed Saud family turned into a US-UK alliance against Iran, which nation has ever since been demonized by the US and UK aristocracies as being a ‘terrorist regime’, even though Saudi Arabia actually dominates global Islamic terrorism, and Iran is opposed to terrorism (except to terrorism that’s aimed against Israel). And everybody who knows anything on sound basis is aware of these established historical facts. But, actually, the US-Saudi alliance is even worse than that: global Islamic terrorism was invented and organized by the US aristocracy in conjunction with the Saud family starting in 1979 when Iran freed itself from the US-UK dictatorship and restored Iranian sovereignty (even though in a highly compromised Shiite theocratic way, nothing at all like the secular Iranian democracy that had been overthrown by the US and UK aristocracies in 1953). The US and Sauds created Islamic terrorism in 1979 in order to draw the Soviet Union into Afghanistan and ultimately used these terrorist proxy “boots on the ground” so as to force the Soviets out of Afghanistan — thereby draining the Soviet economy in the hope of ultimately conquering the USSR and then conquering Russia itself, which the US President GHW Bush on the night of 24 February 1990 made clear that the US and its allies must do — he gave the European vassal-nations their marching-order on that date, and they have reliably followed that order, until now. Russia, which the US aristocracy craves to conquer, is an ally of Iran (which they hope to re-conquer). The basic principle of America’s aristocracy is repudiation of national sovereignty. That’s what the US Government globally stands for today. Russian Television headlined on May 11th, “‘Are we America’s vassals?’ France vows to trade with Iran in defiance of US ‘economic policeman’” and reported that US President Donald Trump’s re-imposition of US economic sanctions against any companies that do business with Iran, is being resisted by all the other nations that had signed the Obama-Kerry nuclear accord with Iran, the “JCPOA” treaty: UK, France, China, Russia, US, and EU (which is led by Germany). The US regime knows that if even America’s allies — UK, France, and Germany — hold together with Iran, to defy the Imperial actions punishing them for continuing with Iran even after the US pull-out from the treaty, then the Western Alliance will be jeopardized, if not terminated altogether, and finally the Cold War, which GHW Bush had ordered the allies to continue even after the end of the USSR, and of its communism, and of its Warsaw Pact military alliance mirroring America’s NATO alliance, will finally end also on America’s side, just as it had ended in 1991 on the Soviet Union’s side. Such an end to the Cold War would possibly cause America’s military-industrial complex — and the stock values of mega-corporations such as Lockheed Martin — to collapse. Thus, the US aristocracy is afraid of peace replacing their existing permanent-war economy. All those trillions of dollars that have been invested in machines of mass-murder abroad, could plunge in value, if UK, France, and Germany, terminate the Western Alliance, and become individual sovereign nations who join with Iran — another individual sovereign nation — to say no to the Imperial power (the US), and yes to national sovereignty, which sovereignty constitutes the sole foundation-stone upon which any and all democracies are constructed. No democracy can exist in any nation that is a vassal to some other (the imperial power). In a world where national sovereignty is honored, democracy would not necessarily exist everywhere, but it would no longer be internationally prohibited by an imperial power, which inevitably is itself a dictatorship, no real democracy at all. Americans accept it. The US public are very effectively controlled by America’s aristocracy. A Yougov poll at the start of 2017 (the start of Trump’s Presidency) asked over 7,000 Americans to rate countries as “enemy”, “unfriendly”, “friendly”, “ally”, or “not sure”; and, among the 144 rated countries, Americans placed at the most hostile end, in order from the very worst, to the 13th-from-worst: North Korea, Iran, Syria, Iraq, Afghanistan, Russia, Libya, Somalia, Pakistan, Palestine, Saudi Arabia, Yemen, and Sudan. Other than Saudi Arabia, which the US Government treats as being its master if not as being its very top ally, and which is, in any case, by far the US military’s biggest customer (other than the US Government, of course), that list from Yougov looks very much like, or else close to, what America’s aristocracy would want to see targeted, as being America’s ‘enemies’. So, other than Americans’ including the top ally both of America’s aristocracy and of Israel‘s aristocracy, Saudi Arabia, on that list of enemies, the list was very much what the US aristocracy’s ’news’media had been promoting as being America’s ‘enemies’. In fact, even though those ‘news’media haven’t informed Americans that 92% of Saudi Arabians approve of ISIS, or that the Saudi royal family financed and organized the 9/11 attacks (in conjunction with others of George W. Bush’s friends), Americans view Saudi Arabia hostilely. That’s acceptable to America’s aristocracy, because the Saud family’s hatred is focused against Iran, the main Shiite nation, and the US public (have been deceive to) prefer Saudi Arabia over Iran. In fact, a 17 February 2016 Gallup poll showed that Iran was seen by Americans as being even more hostile toward Americans than is Saudi Arabia. So, America’s aristocracy have no reason to be concerned that their chief ally and second-from-top governmental customer, the Saud family, are unfavorably viewed by the US public. Both in America and in Saudi Arabia, the aristocracy effectively controls its public. Thus, the American people think in the way that the American aristocracy want them to — supporting any conquest (e.g., Iraq 2003, Libya 2011, Syria 2012-) that the aristocracy want to perpetrate. Of course, the way to achieve this control is by means of the windows through which the public get to see the world around them, which windows on the world are the nation’s ‘news’media. So, though the American public will continue to support the American Government (despite distrusting both their government and their ‘news’media), foreign publics aren’t so rigidly under the control of America’s aristocracy; and therefore Europe’s aristocracies could abandon their alliance with the US aristocracy, if they strongly enough want to. Their ‘news’media would obediently do whatever they’re told, and could begin immediately portraying the reality of the US Government, to their people — including, for example, the reality that the US stole Ukraine, and some of the participants have even confessed their roles; Russia did not steal Crimea (and the Crimea-Ukraine issue was the alleged spark for the ‘restoration’ of the Cold War — which The West never actually ended on its side, only Russia did on its side). An end of The Western Alliance (America’s empire) could happen. But it would require — from the EU’s leaders (and/or from Turkey’s Erdogan) — courage, conviction, and a commitment to national sovereignty’s being the foundation-stone to any democracy anywhere, and this change-of-political-theory would be something drastically new in Europe (and-or in Turkey), which is a region that has historically been staunchly supportive of empires, and thus supportive of dictatorships (ones that are compliant — foreign stooge-regimes). It would require a historic sea-change.